(186 x 261 mm) 8.3 x 11.7 in. (186 x 261 mm) 11 x 14 in. (272 x 383 mm) 11.7 x 16.5 in. SMALL 10 x 14.1 in. (255 x 358 mm) 12 x 17.5 in. MEDIUM 14.9 x 21 in. (378 x 533 mm) 18.5 x 24 in. Manjushri, the bodhisattva of wisdom, is venerated in Nepal as the enlightened being who first brought all knowledge, skills and learning to the Kathmandu Valley. Manjushri first came to Nepal from his 'five-peaked' mountain abode of Wutai Shan in China, bringing his two consorts and many of his disciples with him. At this time the valley of Nepal was submerged beneath the waters of a great lake known as Kalirada, so with his sword Manjushri cleaved a gorge through the surrounding southern hills, thus enabling the lake's receding waters to drain south towards India. Manjushri then founded the town of Manjupattana in this now fertile valley, enthroning his disciple, Dharmankara, as the first king of Nepal. 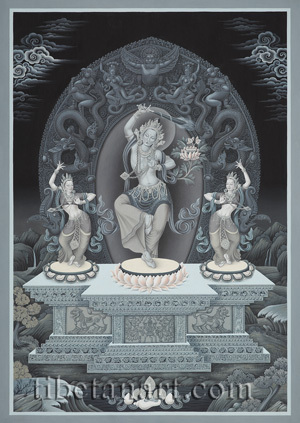 In this black and white composition Manjushri is shown dancing with his two wives upon a communal throne. Manjushri is youthful, radiant and peaceful, and he stands in dancing bow-and-arrow posture upon a moon disc and a pink lotus. He wears the five divine silks and eight jeweled ornaments of a bodhisattva, and his beautiful face has two bow-shaped eyes. With his right hand he wields aloft his fiery wisdom sword, which is known as chandrahasa, the 'Moon-derider'. With his left hand he holds the stem of an immaculate lotus in front of his heart, which blossoms at the level of his ear and bears the text of the 'Perfection of Wisdom' (Skt. Prajnaparamita-sutra) upon its seed-head. Dancing upon moon discs and multicolored lotuses to Manjushri's right and left are his two wives or consorts, Kesini and Upakesini, who are also known as Varada and Mokshada. They both wear the five divine silk garments and eight jeweled ornaments of a female bodhisattva, which include the three Newar necklaces of a kumari or young 'virgin-goddess'. Both consorts stand gracefully in symmetrical dance postures, with the fingers of their hands making two of the main gestures of classical India and Newar dance. The ornate throne upon which these three bodhisattva deities dance is adorned on its central facade with a tripod that supports the combined assembly of the eight auspicious symbols and two stylized lotuses, with offering goddesses appearing on its two corner pillars. Two roaring lions guard the façade's outer panels, with the emblems of an elephant and lion (Skt. gaja-simha) appearing on their corner pillars. The steps of the throne are embellished with the scrolling motifs of flowers, roundels and petals, and its upper plinth with scrolling roundels that contain the small images of swans, lions, elephants and deer. Manjushri's ornate torana encircles his aura at the back of the throne, and consists of the traditional Newar emblems of auspicious and mythological creatures. At the base of the torana are two ferocious makara or 'water-monsters', each with a long scrolling tail and a crescent-shaped crest protruding from its mouth. Above the makara are two jewel-grasping dragons, two rearing griffins or garuda-lions, and two serpent-crested naga-queens with human bodies and long serpentine tails. The torana is crowned by the triumphant image of Garuda, who spreads his wings and arms wide while grasping the coils of the naga-serpents with his sharp talons. The background landscape of this painting shows distant hills, waterfalls, trees, rocks, and clouds. And above the lake at the bottom centre is an offering of the five sense objects: a mirror (sight), cymbals (sound), a conch filled with perfume (smell), jewel-fruit (taste), and a silk ribbon (touch).